Hoof, British Equestrian Federation, 2012 Initiative, Take back the reins, start horse riding, horse riding lessons, horse riding courses. Exercise that is enjoyable ! 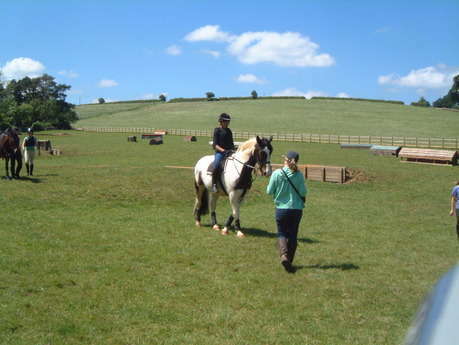 Horse riding is a very good way to get exercise, fresh air and enjoyment. Almost without realising it you will tone up your muscles and have a gentle workout. Even half an hours riding a week makes a difference to your physical and mental wellbeing. Enjoyment for the whole family ! A sport that all ages can enjoy you are never 'too old'. Kids, parents and grandparents can ride out together. The Benefits - Riding combines the benefits of joining the gym, taking a walk in the country, having a holiday, meeting good friends. What else combines exercise & relaxation, with a complete change of scene and routine? Equipment - no special gear necessary. We can hire you a hat and lend you some boots to get going. Taster Session - suitable for anyone. A half hour lesson in the school followed by a half hour ride round the fields all off road. £40.00 per person.